Physical characteristics: The bird named for the rainbow has an orange beak and red, yellow, green, and blue feathers. Body color varies by location. Some birds have blue and purple heads and green feather collars around their necks. Lorikeets measure 10 inches (26 centimeters) from head to tail. The birds weigh from 3.5 to 5.8 ounces (100 to 167 grams). Unlike other members of the parrot family, the lorikeet can't open seeds with its beak. The lorikeet has a pointed bill and a "brush-tipped" tongue. The brush is made of tiny hairs on the tongue. This allows the lorikeet to eat pollen and nectar. Geographic range: Rainbow lorikeets live in Australia, New Guinea, Indonesia, and South Pacific islands including the Papuan Islands. Habitat: Rainbow lorikeets live in wooded areas where flowers grow. Habitats include rainforests thick with trees, grasslands where there are few trees, and people's gardens. 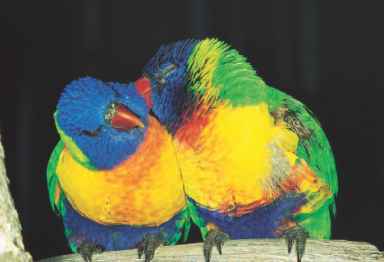 Diet: Rainbow lorikeets use their brush-tipped tongues to get nectar, the liquid in flowers that bees turn into honey. The birds also eat pollen, which also comes from flowers. Birds also eat fruit, berries, grain, leaf buds, insect larvae (LAR-vee), and some seeds. They feed in the wild and from feeders in people's gardens. Behavior and reproduction: The lorikeets travel in pairs, family groups, and flocks. Rainbows are monogamous and breed from October to January. The months when birds mate vary by region. Nests are built in a hollow tree limb where the female lays from two to three eggs. 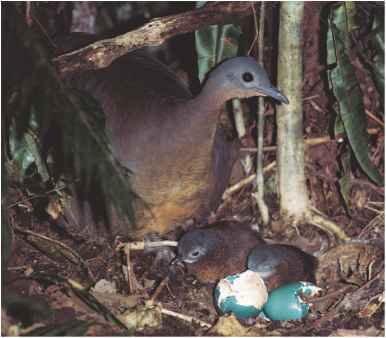 Both parents incubate the eggs until they hatch in about twenty-five days. Rainbow lorikeets and people: Rainbow lorikeets are popular cage birds. However, in the wild they can damage crops because an abundant food source could attract hundreds of birds. Freud, Arthur. The Complete Parrot. New York: Howell Book House, 1995. Rauzon, Mark. Parrots Around the World. New York: Franklin Watts, 2001. Greij, Eldon. "Bird Brain: Feats Performed by One African Grey Parrot Raise Questions About How Much All Birds Think." Birder's World 17, no. 6 (Dec 2003): 76. "Maybe What Polly Wants is a New Toy." Science News 164, no. 5 (August 2, 2003): 78. Myers, Jack. "Parrots That Eat Dirt: Why Do They Do It?" Highlights for Children 56, no. 12 (Dec 2001): 12. Brightsmith, Don. "What Eats Parrots?" Duke University. http:// www.duke.edu/djb4 (accessed on April 23, 2004). "Rainbow Lorikeets." San Francisco Zoo. http://www.sfzoo.org/ cgi-bin/animals.py?ID=60 (accessed on April 26, 2004). Triveldi, Brian. "Poachers and Fires Menace Endangered Parrots." NationalGeographic.com. http://www.nationalgeographic.com.news/ 2003/06/0609_tvmacaw.html (accessed on April 27, 2004).